Learning Assessment #3 is carried out over two class periods. Parts 1 and 2 are completed in the first period and part 3 in the second. The two parts are graded separately and have separate feedback activities. 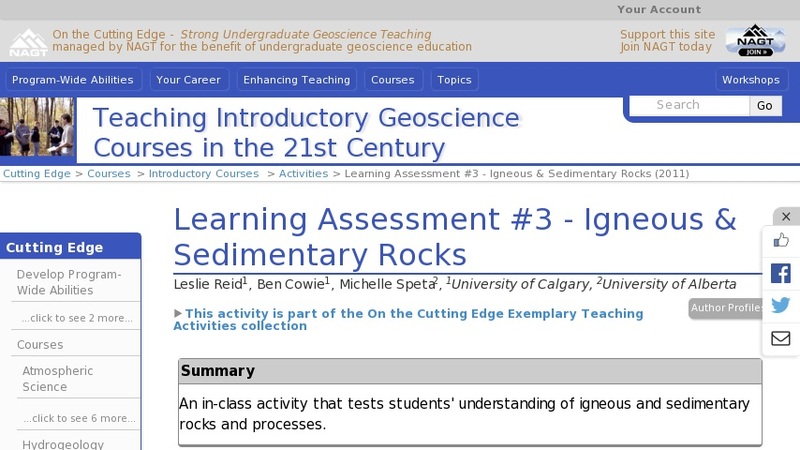 Part 1 of this activity is on igneous rocks and processes. Students are provided with a cross-section and asked to describe the igneous processes that are occuring at 4 different locations marked on the cross-section. They must also describe the name, type (intrusive vs. extrusive) and chemistry (felsic vs. mafic) of igneous rock that would be forming at each location. A detailed geologic map is also provided.Part 2 of the activity is on sedimentary rocks and processes. Students must indicate on the same cross-section where each of the 3 major sedimentary processes is predominant (weathering/erosion, transport, deposition/lithification). For bonus marks, in the areas of deposition/lithification, students can indicate the type of sedimentary rock that would form (sandstone, shale or limestone).Part 3 of the activity asks students to interpret the geologic history of the Diasen Volcano, based the provided detailed geologic map (from Tamura et al. (2003); used with permission from the publisher). Students must describe the volcanic activity that would have been occurring and sketch a small schematic cross-section for four specified time periods.